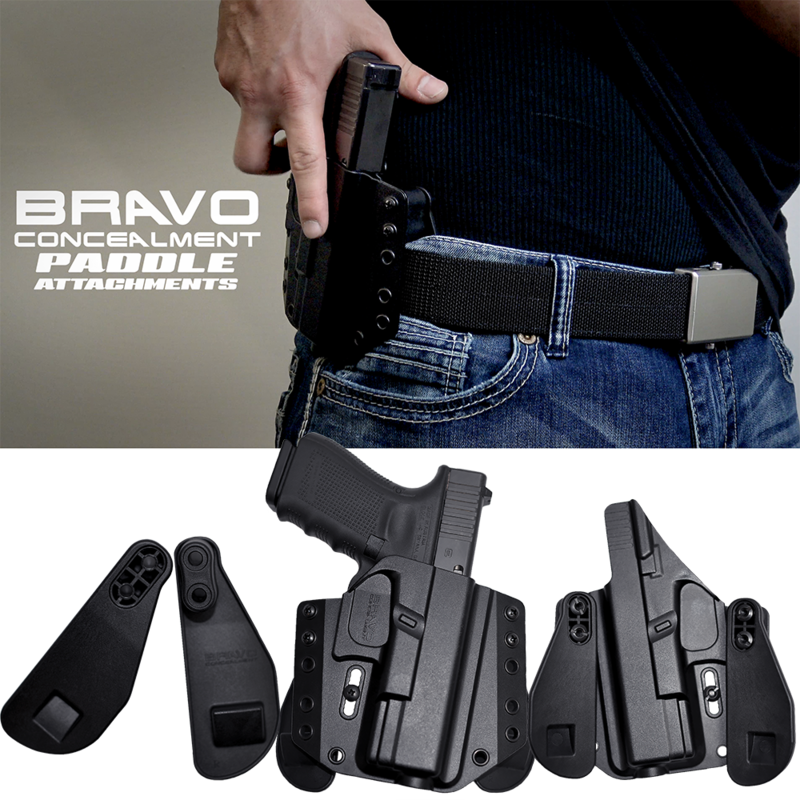 Bravo Concealment has new paddle attachments. Unlike most, these come in two pieces instead of just a single large paddle. Bravo Concealment, has just announced their NEW Product Release making Concealed Carry soooo much easier. These attachments convert your OWB gun holster and magazine pouches into a quick “on and off” paddle holster. Imagine not having to thread your belt through the holster belt loops anymore. Just slip your gun holster over your belt, it’s that simple. These Paddle Attachments hold on to dear life and will not let go until you decide otherwise. Comfortable to wear all day long, these attachments make your everyday concealed carry lifestyle easy. Made out of a robust polymer blend, these attachments are tough and durable for long lasting and are lightweight for extreme comfort. Easily attaches to your gun holster or magazine pouches by swapping out the standard belt loops and installing the Paddle Attachments with a regular Philips screw driver. Accommodates to Bravo Concealment mag pouches. As always, our Paddle Attachments come with an ULIMITED LIFETIME WARRANTY, 30-day Monday Back Guarantee, all while offering Free Shipping. The Paddle Attachments are available now with a MSRP of $23.89. Get yours NOW as they pulled price down to $19.89 with an introductory special!